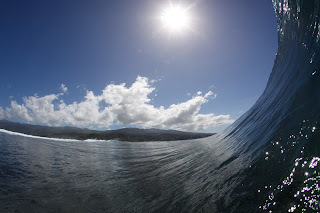 With a medium southerly groundswell hitting the secret reef, we paddled out to the glassy barrelling surf. 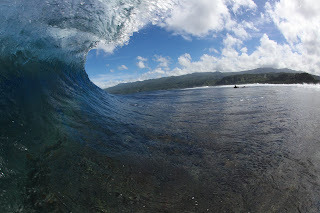 The swell direction wasn't ideal for stand up surfing, with sets wedging up into thick heavy barrels (perfect for bodyboarders!). 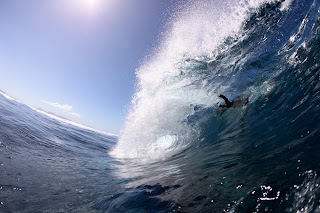 The lefts were pretty gnarly, with Owen (Tui Tai Dive Instructor) out in the surf for the first time ever in an attempt to take pictures of Expedition Guide Tim. A couple of monster sets came in, washing up Owen on the reef before he could get more than a couple of photos. Tim later swam out with his camera at the rights which were peeling and more makeable. Joining the boat today was Kath from Sydney, James from Sydney, Ilona & Natalie & Urszula from New York, and repeat visitors Mike & Michael & Peter from Colorado. 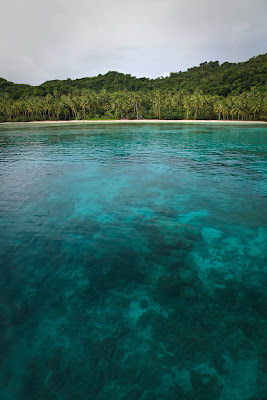 Snorkeling and kayaking from a secluded pristine beach on Vanua Levu were the first orders of the day. Back to the boat and a choice of diving or snorkeling in Natewa Bay. 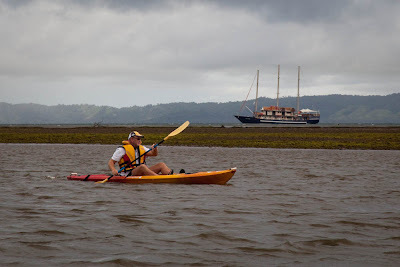 It's the second biggest bay in the Pacific, and its deep waters are little explored. 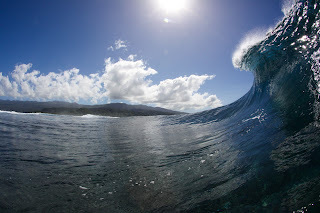 Despite a lack of current to flush water and replenish nutrients, the visibility and marine life is surprisingly good. With all the guests now aboard and settled in, it was time for dinner followed by an early night to get some rest for the packed itinerary in the week ahead. 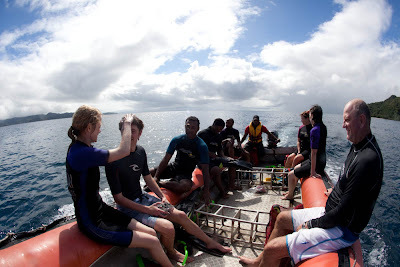 Whilst some did yoga on the top deck in the morning sunlight, the divers embarked on an exploratory dive off western Rabi led by Divemasters Owen and Tim. 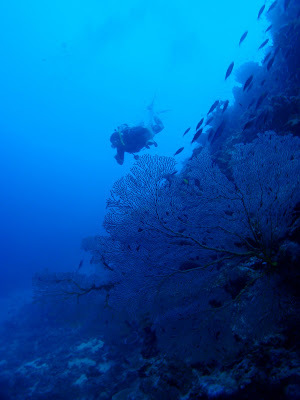 It was real nice start to the day - descending down the wall to 20m, seeing a turtle & blue spotted stingray. A 5m safety stop hovering over the coral gardens was quite spectacular and we came across an enormous lionfish - poisonous but very shy! 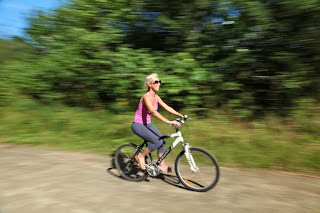 After a serious breakfast of eggs, cereal, toast, and fruit we embarked on a coastal bike ride. The Colorado crew went on a walk through the village followed by a boat ride exploring the nooks and crannies of the jutted coastline. 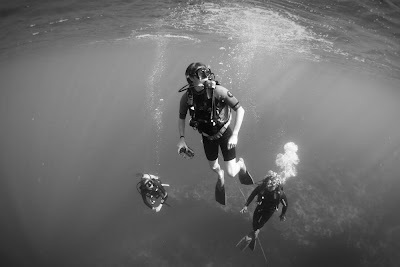 The New York girls were keen to learn to scuba dive and our lunchtime anchorage on the SW of the island offered perfect shallow water off the beach for their introductory dive. Meanwhile snorkelers checked out the reef at Dolphin Bay, and James managed to get some nice photos of the abundant anemone fish. 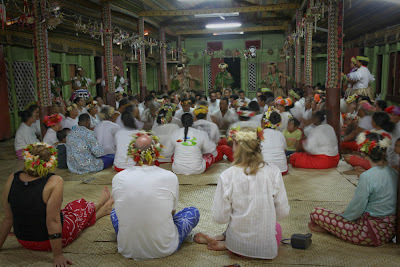 A change in weather brought wind and rain, and we found shelter in a bamboo ceremonial hut as we took part in a traditional meke dance with the Micronesian settlers of Rabi. 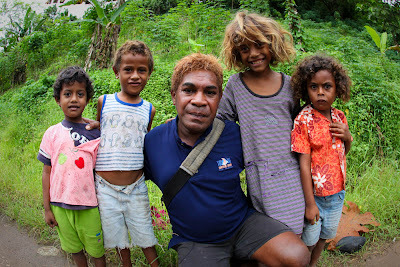 A busy day was brought to a close with a lovo ground oven dinner of honey glazed pork and chicken, and onboard zoologist Tim made a presentation on corals and marine life of Fiji. A warm orange sunrise lit the clear sky on what was a very windy day in the Somosomo Strait. 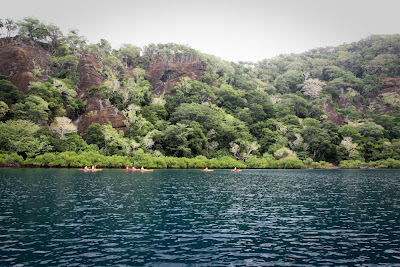 From our sheltered anchorage we made out across the Strait for offshore diving at Rainbow Reef, only to make a judgement call to change course and dive at the sheltered island of Coral Levu - a decision based on the worsening winds and resulting choppy seas. 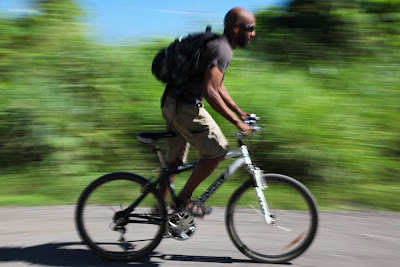 Biking along the Taveuni coast we stopped at the Meridian Line, famous church and botanical gardens - all before squeezing in another dive before lunch. Motoring over to Kioa in the afternoon provided another chance to snorkel, this time at the renowned spot called 'The Farm'. The teal coloured water here holds a large numbers of a certain sting-free jellyfish which add particular interest to the site. 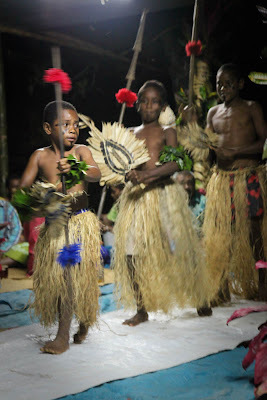 To visit the immaculately kept village of Kioa you need an invitation, and tonight we would be treated to special a Polynesian song and dance, typical of the islanders of Tuvalu further north in the Pacific. The windy weather subsided enough to facilitate our passage out to Cobia island in the Ringgold atolls. 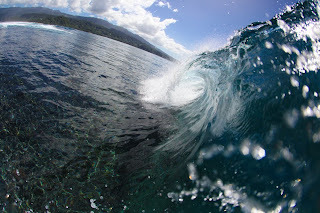 A moderate swell made for an exciting dive site entry that preceded an otherwise mellow dive at spectacular Kokoda Point. Black tip reef sharks and some schooling baitfish were particular highlights. With spring tides in full force we planned a careful itinerary for the volcano hike, and this perfect timing enabled a safe island drop-off. Admiring the flora and fauna on the walk, we came across a shy snake huddled in the rock and later a huge stick insect lying wounded in the dust. More wall diving in the afternoon, with the super-clear water making 25m feel like 10m. 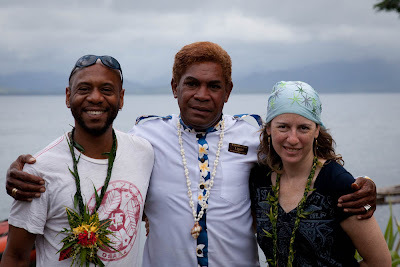 Steaming back towards Taveuni with cocktails in hand, Liga shared his wisdom and knowledge of Fijian history and culture - telling grizzly tales of cannibalism and showing us the funky haircuts typical of indigenous Melanesian culture. 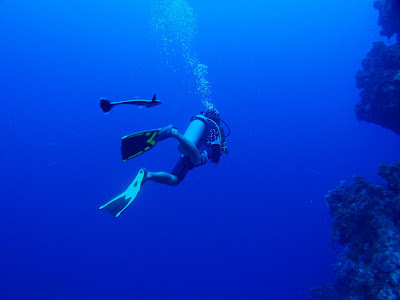 The diving this morning was truly breath-taking. 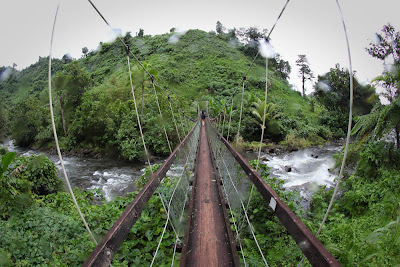 The site is known as 'Stillwater', having strong currents in places! 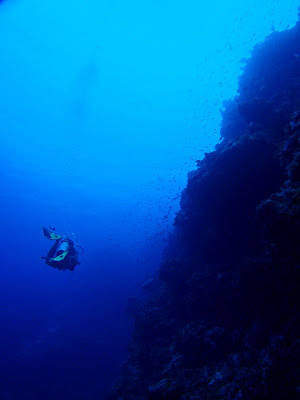 Following the experienced divemaster on this kind of drift dive makes for an fun and easy experience. 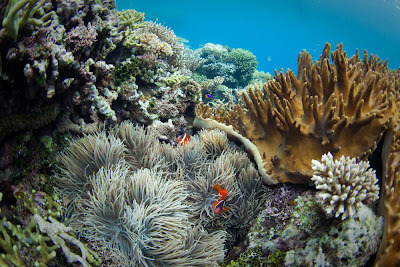 The nutrient rich current allows soft corals to thrive, pumping them up into electric hues of pink, purple and orange. 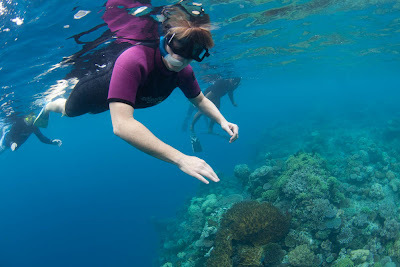 Parts of the coral gardens, with their accompanying schools of multi-hued fish, were just amazing. 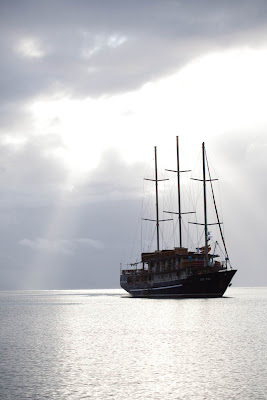 Moving west of Qamea we anchored off eastern Taveuni and set out mountain biking southwards down the coast. 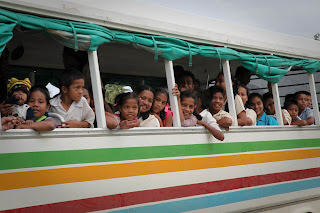 It's a challenging ride today and a few opted to ride in the support bus. Reaching the towering waterfalls at Tavoro creates a buzz of excitement and everyone is in the water cooling off from the sun. Jumping off the ridge behind the falls provides entertainment before we headed up through the rainforest to a second waterfall upstream. 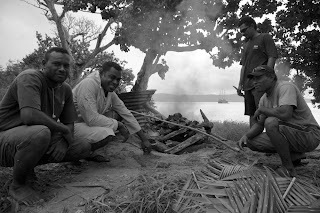 BBQ lunch, yagona ceremony, melanesian meke, lobster dinner, a few drinks to celebrate with James on his last night, bed! 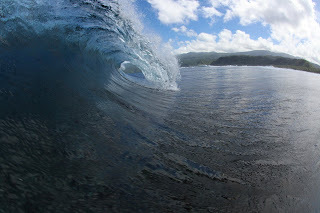 We just couldn't resist another dive at 'Stillwater' today, and it didn't disappoint! 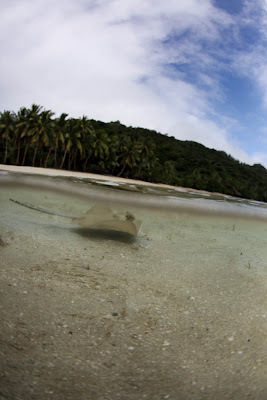 Untouched coral, sharks, exciting bathymetry - what more can you ask for? Tim and Owen checked out the surf, and it proved to be quite big and scary. Stay tuned for photos coming soon. Some more surf reconnaissance later on revealed the rights to be peeling perfectly at about shoulder high, with makeable barrels on the inside. 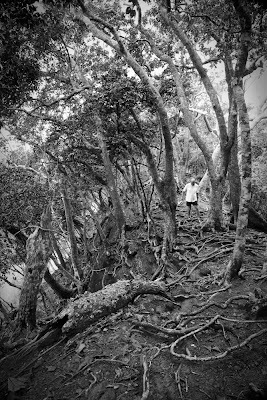 Meanwhile, others ventured to a series of remote waterfalls in the nature reserve, and hiked back along the coast for lunch. With our marine enthusiasts keen to get back in the water, we went for a sunset ssnorkel at the northern tip of the island. 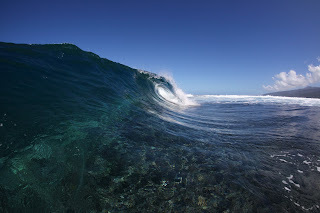 The shallow reef plateau is perfect in this kind of low light scenario. Kath came across an unidentifiable species of eel, and our anemone spotters just kept on finding nemo. 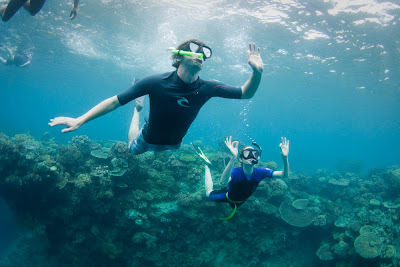 A slightly more relaxed day at Albert Cove still offered the usual morning activities - diving, snorkeling and yoga. Some divers perfectly timed their arrival at the reef's wall drop off, being greeted by a HUGE passing eagle ray. An inquisitive barracuda and more perfect soft corals rounded off another great dive. 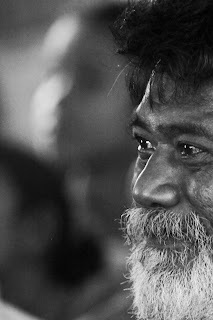 The isolated self-sufficient villagers loved receiving prints of their photo that had been taken in prior weeks. Kayaking off paradise beach, we explored the protected corner of the bay and hiked up to the natural cyclone shelter provided by the thick wind-eroded rock. Motoring back down Natewa Bay was a chance to review the week's images shot by the boat photographer, which was only disturbed by an onslaught of flying fish!! 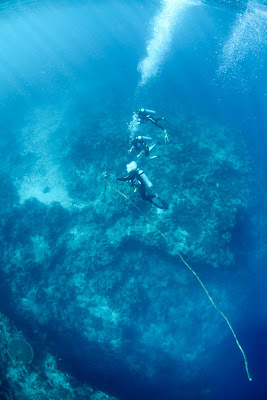 Some really great diving this week. 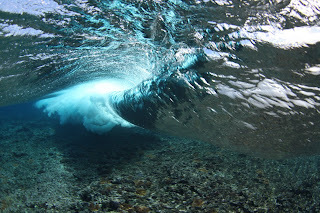 Despite the super windy weather out at the Ringgold Atolls, there were some really memorable dives. 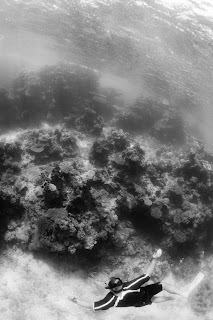 Sheer walls of reef, sharks, morays, turtles. A distant silhouetted white tip reef shark glides across the reef. 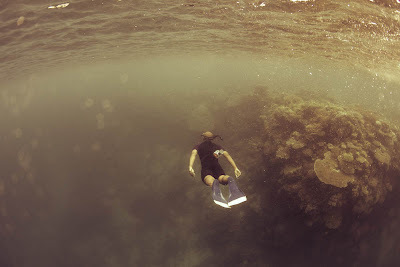 James from Sydney captured some awesome photos with his new Olympus underwater camera setup. Check out the remora that closely followed divemaster Tim throughout the dive - it even tried swimming up his shorts! The dive site 'Stillwater' offered another excellent dive yesterday, with a moderate current being enough to inflate the soft corals into electric hues of pink and orange. More sharks and spectacular coral gardens - and there was even a dolphin sighting at the surface! Paul from Montana this week became the first person ever to get a tattoo onboard Tui Tai! 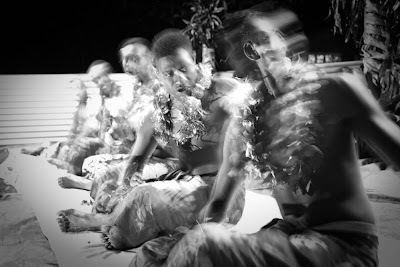 The photo shows deckhand Tom drawing the design before he went on to perform the traditional Fijian needle-pricking method. Apparently it was quite painful. 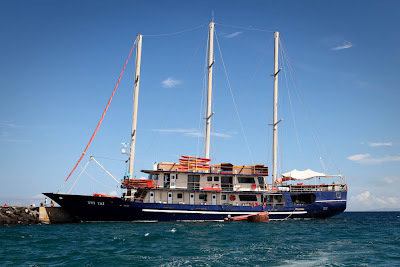 Another great week on Tui Tai with 21 guests, consisting of four families from Australia. 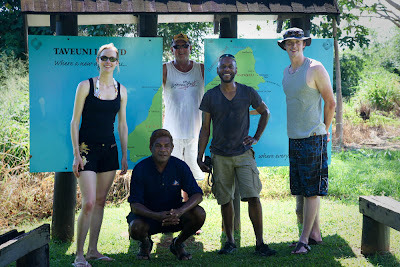 An action packed few days included trips to Rabi, Kioa, Taveuni and Ringgold Atolls. 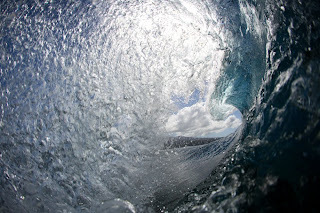 The young surfers and bodyboarders onboard were particularly stoked, scoring barreling 3-4ft surf on their last day! 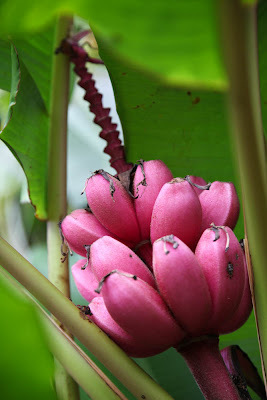 Do you find the Tui Tai experience held up to its promises? 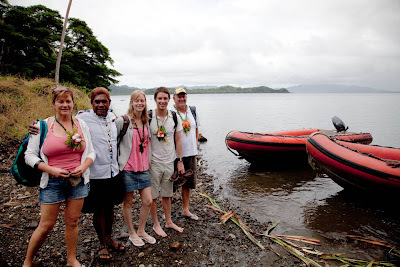 Joining us this week are Kevin & Charlotte from Tampa (USA), John & Helen from our very own Taveuni (Fiji), and Molly & Kate who are from Ocean Magazine based in California. 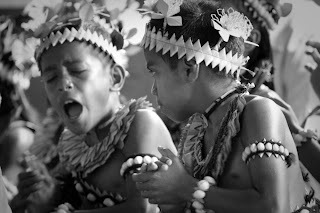 Angus and his crew bellowed out a welcome song as the guests arrived at the boat. Serious focus in the morning yoga. Maybe these two just didn't get along? Joined today by Rick & Jenny from the UK, Kevin & Betsy from the USA, and repeat visitors Steve & Tracy from Australia. 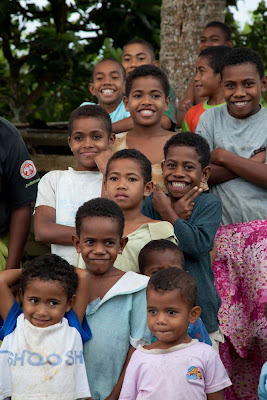 Cloudy skies didn't dampen the spirits of the new arrivals and, as we steamed up through Natewa Bay, there was an air of excitement for the day's activities. 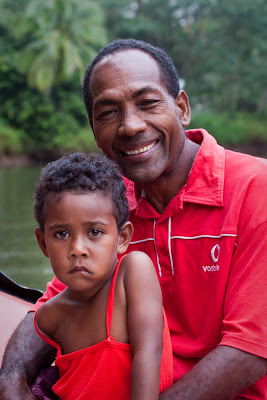 After refreshments and a bite to eat, we arrived outside a small river community on Vanua Levu's coast. Reaching the beach was tricky at low tide, and deckhand Saku did an expert job finding deeper channels in the reef. Stepping ashore some of us lost a sandal in the thick squelchy mud! 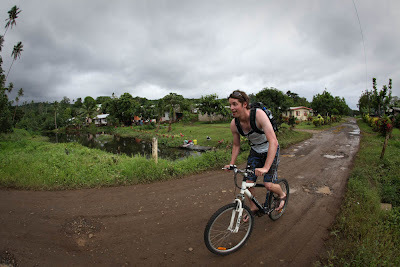 But locals came running over to the rescue, digging our shoes out of the mud. 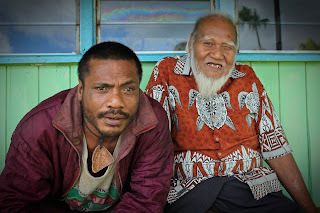 The villagers were so welcoming and Kevin enjoyed some good banter with the elders. 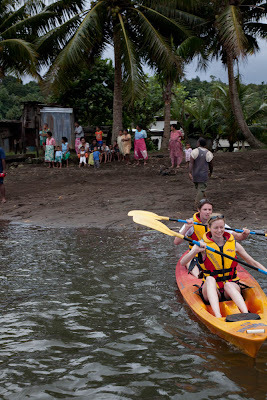 A relaxing kayak usptream led by Liga was a great way to ease everyone into the physical activities on offer throughout the week. 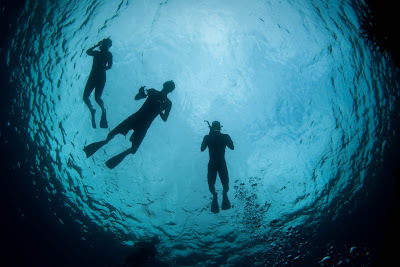 The late afternoon offered good diving conditions and a perfect way for Steve, Rick and Jenny to re-familiarise themselves with their equipment. Meanwhile Tracy, Betsy and Kevin went snorkeling. 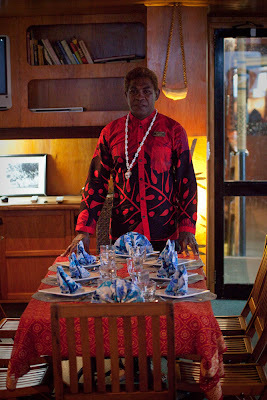 Our Tui Tai chef Mickey, an expert in Fijian cuisine, blew away the guests with an exceptional evening meal that was well deserved after the day's exertions. 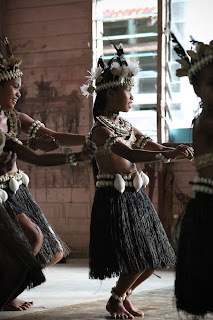 Rabi island is unique in Fiji with it's distinctive Micronesian culture. 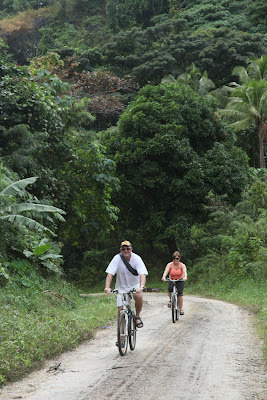 Starting the day with mountain biking along its gently-sloping coastline we would shout “Maori” to passers by. 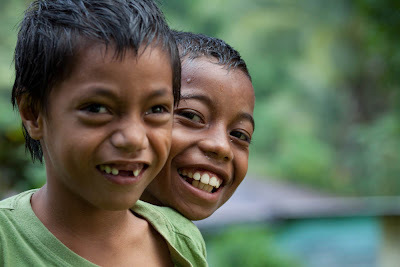 Different to “Bula” this greeting, along with other parts of their original language, still remain in use. 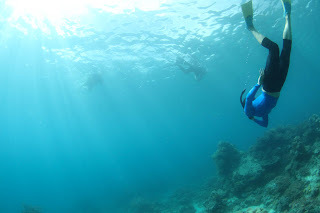 We squeezed in a snorkel session before lunch and a few were diving down holding their breath for a closer look. 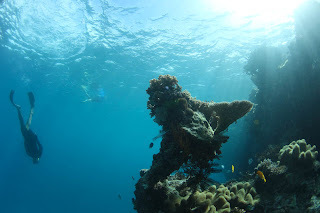 The divemasters on Tui Tai are constantly pioneering new dive sites in this part of Fiji, and we went in at 'Saku's Coral Patch' – dived just once before. 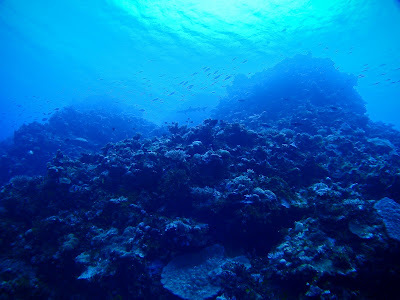 Visibility was much better than in Natewa Bay, so it also provided great snorkeling conditions. 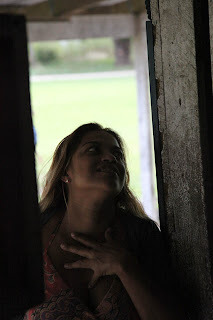 With possible dolphin sightings in Dolphin Bay, Betsy and company kept their eyes glued on the water throughout lunch. 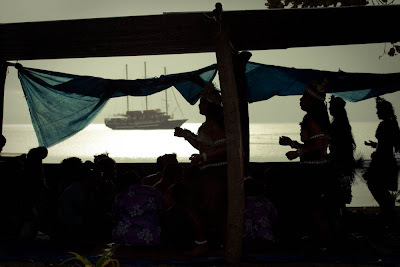 We were in for a real treat before dinner as we headed to shore to witness a traditional Micronesian dance. 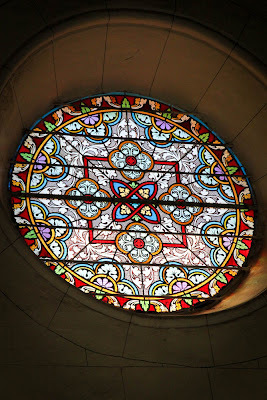 A downpour of rain only added to an electric atmospheric as guests and villagers gathered undercover to watch the young performers backed by a roaring choir of children. 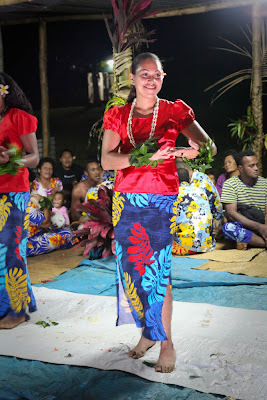 Guests on Tui Tai are welcome to bring gifts for when visiting these remote island villages and on this occasion the items went down a storm – particularly the soccer ball! In thanks the guests were invited up to dance, and Rick was leading the way busting all kinds of shapes and even twirling the island beauties. Keen photographers Kevin and Betsy entertained everyone with their Polaroid camera and the instant photo prints created a frenzy of excitement. 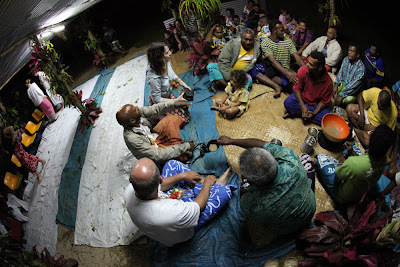 Whilst a traditional ground oven 'lovo' dinner was being cooked on the beach, Tui Tai guests were given a pre-dinner presentation on marine biology and fish identification by onboard zoologist Tim. 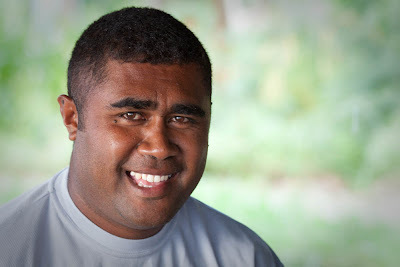 Dive leader Isoa dispels any fear of an attack by a gang of fierce sharks, identifying the animals as pilot whales! They pass right beneath the boat and we stick our heads under for a closer look. They move with effortless power and grace and swim off into the distance. Pretty exciting for 7am! 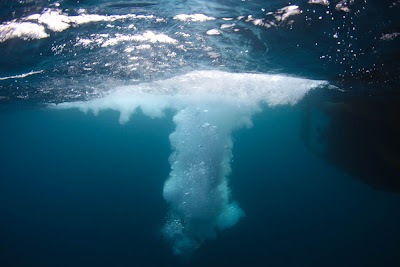 Continuing in the same vein we motored on to our dive spot – the Great White Wall. Its name doesn't come from the shark, with that species not living in the warm waters of Fiji, but instead it comes from spectacular white soft corals that are unique to this spot. 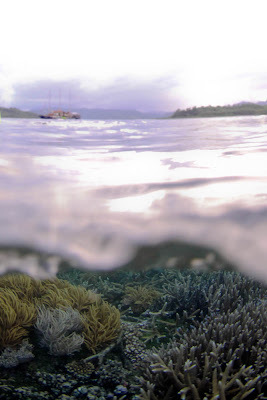 They should not be mistaken for bleached corals elsewhere that have expelled their zooxanthellae and lost their colour due to global-warming-related sea temperature rise. 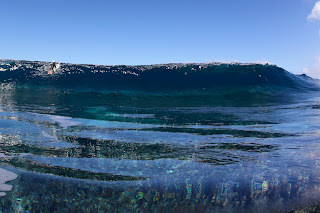 In the gin clear water descending down through stunning swim-throughs to the wall drop-off was truly memorable, and we encountered inquisitive white tip reef sharks, stalking barracuda and even a friendly hawksbill turtle! Coming up from the dive, Rick and Jenny exclaimed “How can this day get any better?! !” Bear in mind it's not even 8am yet! Our good luck continued on our way back to the Tui Tai through the Somosomo Strait as we came across the same pilot whales again!! All our heads in the water watching the spectacle, we managed to get a few photos. With tales of whales told through breakfast, Betsy and Tracy (who had been doing yoga class earlier on) went out in the dinghy for a look. 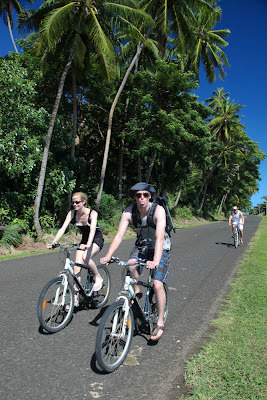 The others went cycling on Taveuni in the now scorching sunshine. Posing for photos either side of the '180-degree meridian', we then went down to the botanical gardens and watched a young boy trying to spear fish in the shallows. 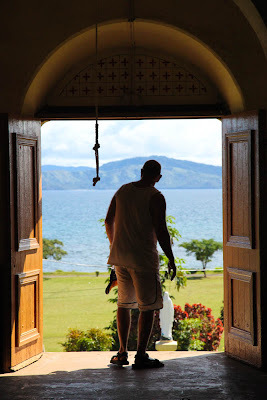 Returning north we stopped at the magnificent Wairiki Catholic Mission that towers over the playing fields with views out onto the Somosomo Strait. During lunch we steamed west to the island of Kioa, where its super sheltered waters were irresistible for the snorkelers. We came across numerous jellyfish, all of which were known to be non-stinging before we got in. Jellyfish will always be jellyfish for some people, but ever-intrepid Betsy bravely went for a real hands-on approach. 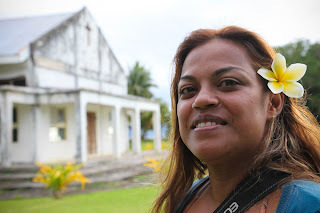 Back on the Tui Tai and time to relax before dinner while Liga made a presentation on Fijian history and culture. 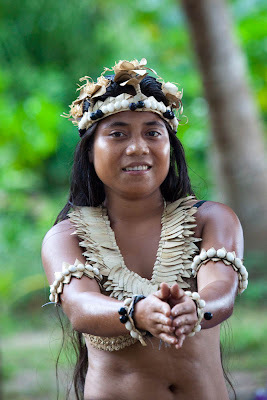 Kioa is a stunning place, and tonight it would come alive in the village as we went ashore for a cultural visit. 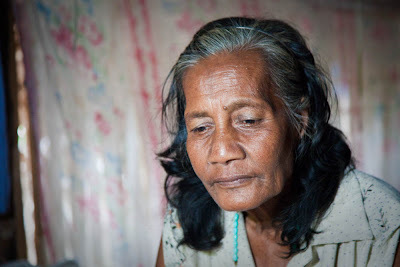 We were first spoken to the by Chief and the elders who explained much of their history. 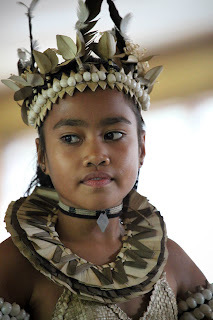 The people here came down from Vaitupu island in Tuvalu, and brought with them their Polynesian culture. 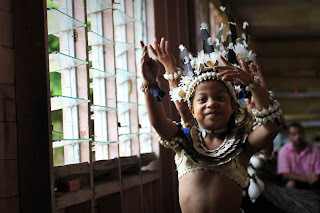 In the colourful village hall we were treated to something special – grass skirts, fast rhythmic dancing, and powerful penetrating music and singing. Tracy, Steve, Kevin, Betsy, Rick and Jenny were all up and dancing by the end in the mass-sweat-inducing humidity. Good times. 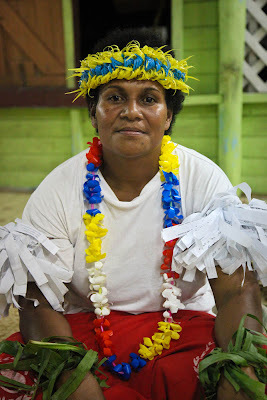 We later had the chance to purchase some of the Kioan woven crafts that are so famous in Fiji. 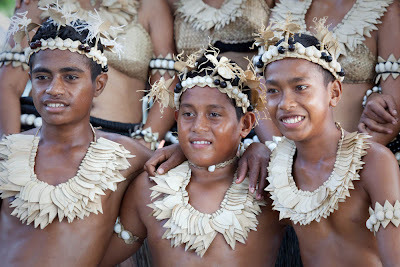 Far east of Rabi island, and north east of Taveuni, lies Cobia (pronounced thom-bee-a). 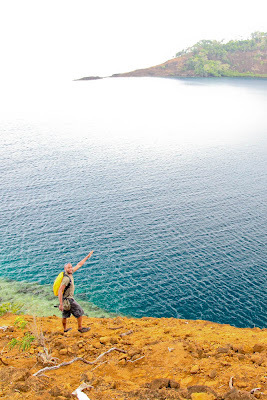 Located in the Ringgold Islands, it is a subsiding volcano such that much of the crater is underwater but is sometimes almost cut off from the sea by the reef at low tide. 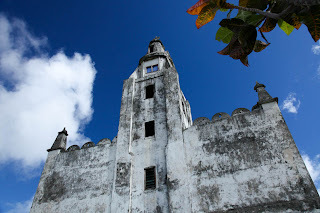 It is an untouched spectacular setting, only visited by Tui Tai Expeditions, and will be the base for today's activities! 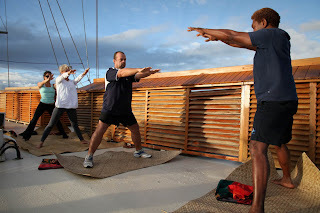 A morning dive at Kokoda Point included sharks and a turtle, whilst those on the boat were really getting to grips with Liga's yoga routine. 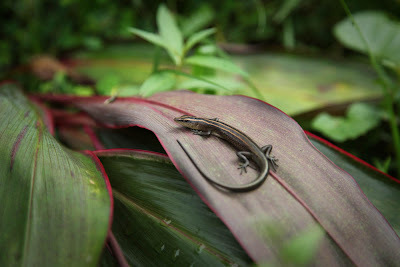 Hiking to the summit of Cobia we came across varied flora and fauna – cyclads, banyan trees, termites, and goats that had been introduced to the island in the past. Liga pointed out some pottery thought to be from the Lapita people who first colonised the Pacific. Views from the top looking down into the crater were breathtaking for all, and before long we were ourselves kayaking through the crater. 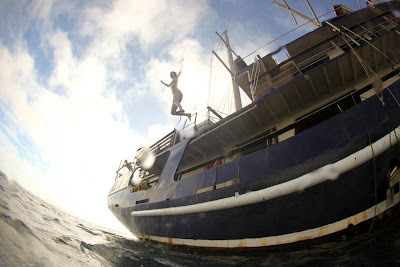 With Tracy and Betsy relaxing with spa treatment on Tui Tai, the rest of us went for a dive at 'Wall Street'. Kevin, who isn't certified but had dived before elsewhere, undertook a 'Discover Scuba' session which allowed him to join us on our shallow dive. Talk about a first dive!! 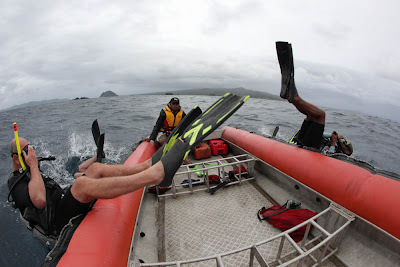 - as soon as we put our masks in the water we could see white tip reef sharks circling below. 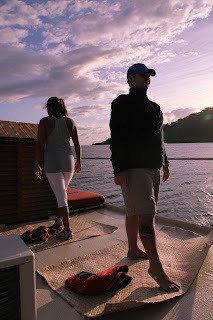 Relaxation, massage, and afternoon tea were the order while we steamed northern Taveuni in late afternoon. 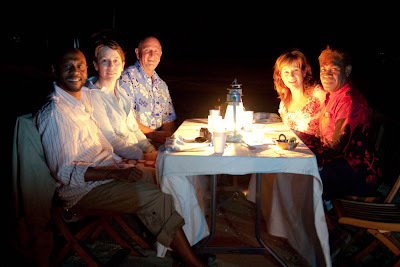 Liga shared more of his wealth of knowledge on Fiji history, and the guests were whisked to shore for a lantern-lit dinner on the beach. Honeymooners Rick and Jenny enjoyed a romantic private dinner. 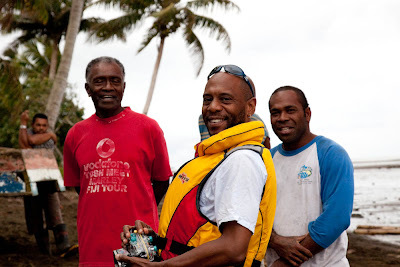 A morning dive at Qamea provided a new experience for the PADI Open Water certified divers, with strong currents dictating the dive plan. 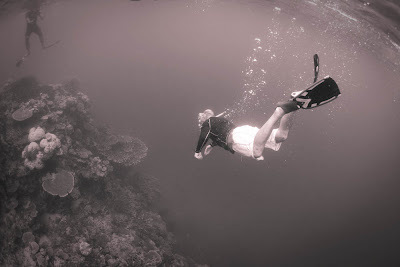 Isoa, a true expert in these waters, planned the drift dive perfectly – and we witnessed barracuda and colourful soft corals as we glided effortlessly over the reef with a real sensation of flying. 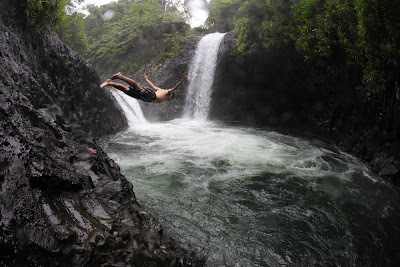 A challenging bike ride down eastern Taveuni proved well worth the effort upon reaching the waterfalls at Bouma. 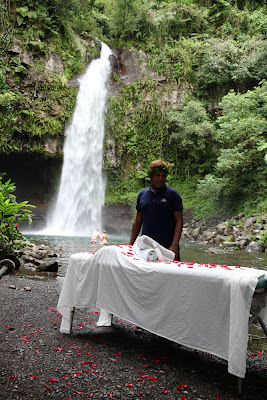 We explored the various levels of the falls and some chose to have a massage. 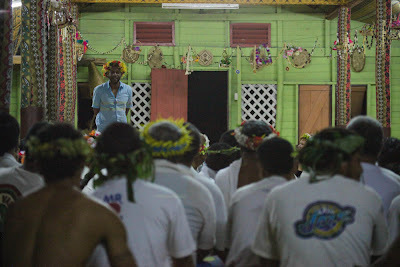 Before dinner we visited Wiwi village to experience indigenous Fijian Melanesian culture through song, dance and a kava ceremony. 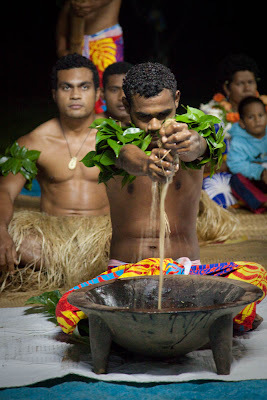 The kava, or yaqona (pronounced yan-go-na), comes from a pepper plant that is dried in the sun and then ground into powder. 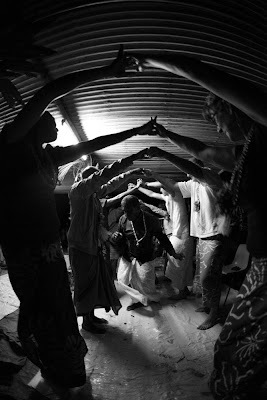 The ceremony we witnessed was very traditional, with Liga seeking the Chief's blessing and the yaqona being worked into the bowl using original techniques and natural materials. 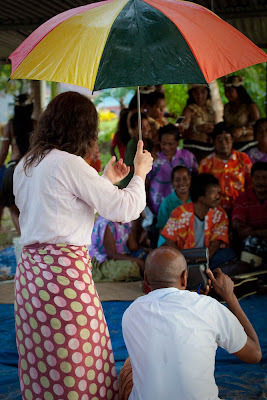 One cupped clap “Bula”, drink, three claps. 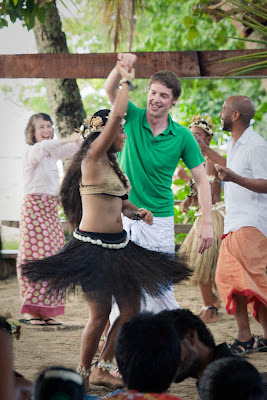 The formality of the welcome is followed by a shift to a party mood with dance known as 'meke'. 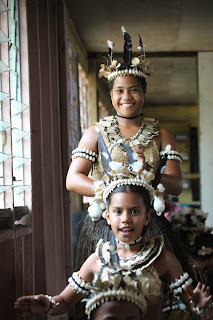 This visit completed our cultural exploration in this Micronesian-Polynesian-Melanesian triangle in northeastern Fiji. 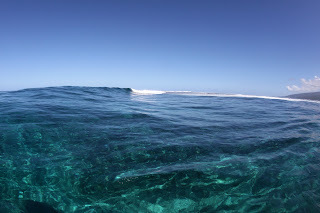 With some rough seas in the morning Tui Tai stayed in a protected spot in the north, whilst divers motored around to a spot called 'Three sisters'. Banded sea snake and huge humphead parrotfish were particular highlights. 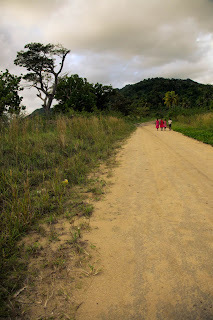 Due to the weather sea kayaking was replaced by a scenic drive through rainforest-piercing dirt road. 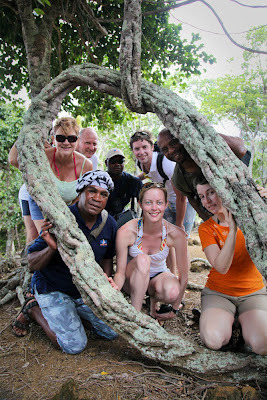 We arrived at Lavena for a coastal walk with a local guide, who showed us all kinds of tricks along the way such as how to open a coconut! 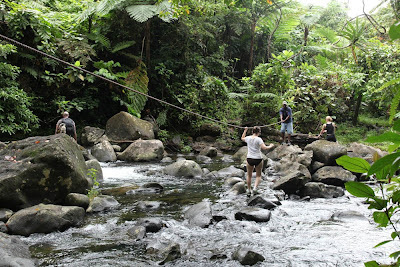 The scenery is lush and the hike takes us along both beach and jungle path. 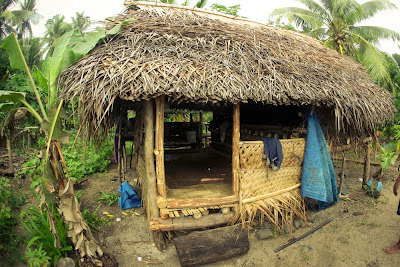 This part of Fiji is remote and has a genuine isolated feel despite the tourist path. 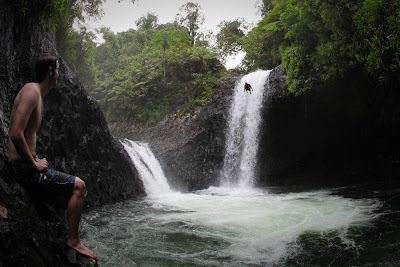 The Wainibau Falls are a real paradise, and Rick and Kevin dare the natural water slide at the smaller falls. Our guide threw himself off the highest falls after clambering up a don't-try-this-at-home rock-face. 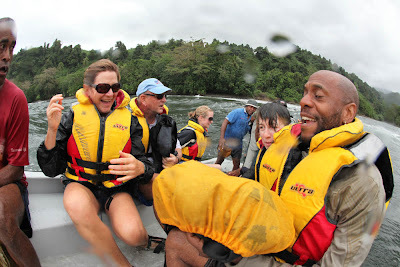 In the fiberglass boat, driven by our eccentric guide, we made our way off the beach only to be hit by a freak wave. Everyone managed to keep their belongings dry but with the boat slowly filling with water we had to turn back to shore that was just a matter of metres away. 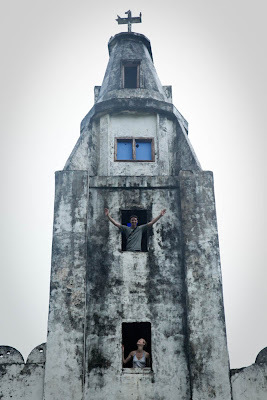 Nothing like a bit of adventure! 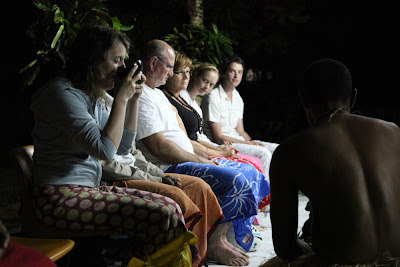 Dinner and a presentation from Tim was a great way to end a busy day on the 'Garden island'. Today at Albert Cove (Rabi Island) was a day to take things slower. 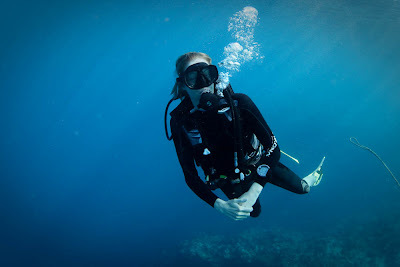 Yoga and diving offered as normal in the morning. 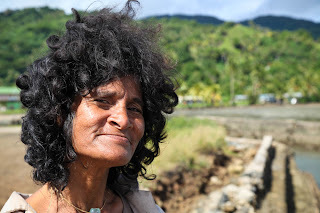 A visit to the small beach village community gave us all insights to a different way of life – from the thatched 'bure' accommodations to the women preparing a massive conch for lunch. 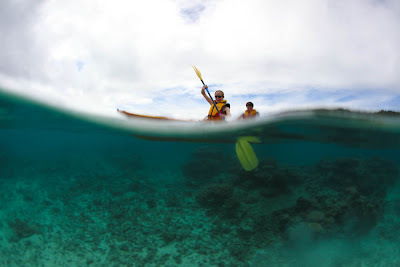 Kayaking from the beach along the bay we passed stingray and colourful corals. 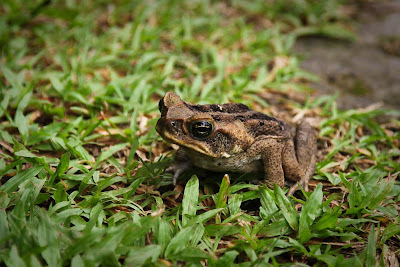 The afternoon provided changeable weather – sunny one minute, raining the next. Rick and Jenny braved jumping from the top deck. 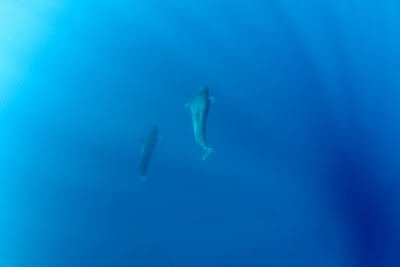 We then spotted dorsal fins off the port side – but were unsure whether we'd seen dolphins or pilot whales. With Kevin, Betsy, Rick, Jenny, Steve and Tracy all leaving tomorrow it proved to be an emotional evening. 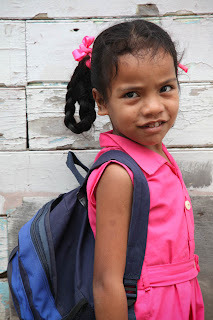 Thanks were said to the Captain and crew, and a photo slideshow session allowed some reminiscing of the awesome week gone by. Some tears were shed this morning as the crew sang their farewell song to the guests, and Kevin & Betsy almost ended up staying on board! 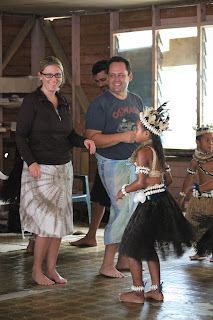 Best wishes Rick & Jenny with your onward travels in Kadavu and Tonga. Steve & Tracy, thanks again, it's been a pleasure having you guys on board again, and all the best with your relocation within Australia. 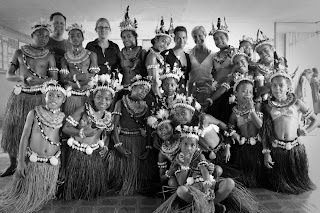 Betsy & Kevin, enjoy your few days in western Fiji, and best of luck with your business and the photography.